We see a lot futuristic concept sketches from architects. Spiraling Japanese ocean cities; skylines like dinosaur eggs on golf tees; or a Paris of 2050 dotted with algae bioreactors and jellyfish-inspired bridges. But if there’s anything we like more than a vision of the future sketched out in clean CAD files, it’s when one of those visions happens to be backed by billions. The former is likely to remain a concept; the latter may be here in a matter of years. Exhibit A: Google’s latest proposal for its Mountain View headquarters. The plans are futuristic, innovative, and take transparency to new levels. The structure would be more of a temperature-controlled open space than a building. Sort of a giant glass-encased greenhouse. 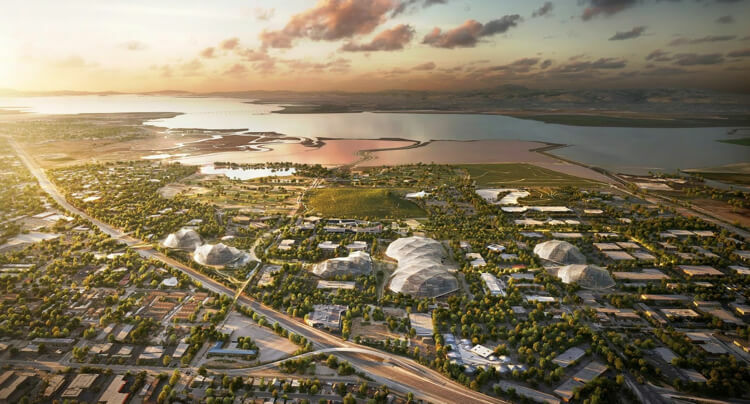 Google’s plan—recently submitted to the city of Mountain View for approval—emphasizes trees and natural scenery, more bike paths and fewer parking lots. Perhaps inspired by their modular Ara smartphone, the interior would contain swappable units of office space, allowing flexibility as priorities and projects change. If transparency is a central theme, another seems to be encouraging open minds and creativity. 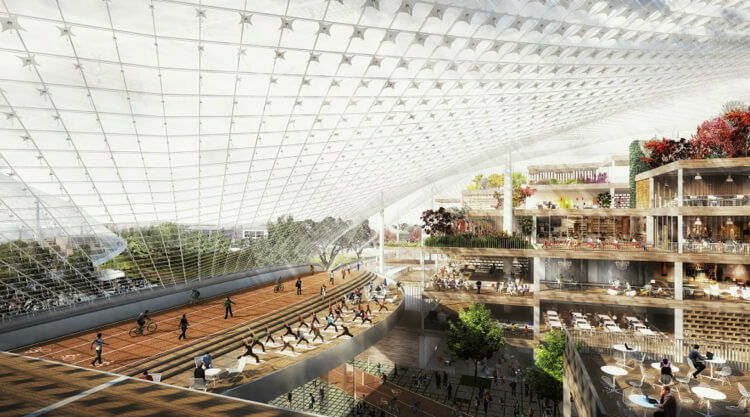 No doubt some interesting ideas might be grown in Google’s Silicon Valley greenhouse (if it’s approved and built). On the other hand, the next Google or Apple is just as likely to take seed and grow up outside the clean lines and sunny climes of a Google chrysalis. Looking at the images, I was reminded of something Jane Jacobs wrote in The Death and Life of Great American Cities. Jacobs said really new ideas can’t afford to do their “chancy trial, error and experimentation” in high rent areas and expensive new buildings. It’s not a hard and fast rule. But it’s easier to break something (an old idea or way of doing things) when you don’t have much to lose or anyone to answer to. Google knows and values this (e.g., Google X). But even at a talent magnet like Google, the fact is, the majority of the world’s brightest brains work outside it. Even so, it’s not an argument against a successful company doing a little high-profile nesting. The plans are nice to look at, and if approved and built, it’ll be a pretty amazing place to visit or work. My only question is: Who’ll keep the windows clean?